Order your Ddrum DDTRSK Red Shot Kick Trigger from AMS and enjoy Fast & Free Shipping. Get the Best Deal with our Lowest Price Guarantee & Great Customer Service! 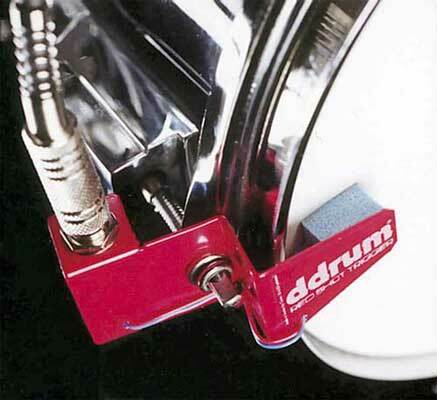 The Ddrum Red Shot Trigger uses the same patented transducer technique (VAM) as the famous Ddrum Trigger. The specially designed transducer is softly pressed against the drumhead. The ultra-light pressure of the transducer against the head prevents any damping effect. The Red Shot Kick Trigger is extremely easy to use and to mount: just remove one tension screw, apply the trigger and put the screw back on again. No adhesive is needed. It features a 1/4 inch jack for connection to a DdrumAT, Ddrum3 or Ddrum4 sound module. Thanks to the patented transducer solution, Ddrum Red Shot Triggers detect dynamics in a very realistic way - a must for any drummer. Using the Ddrum Red Shot Kick Drum Trigger together with DdrumAT/3/4 sound modules is a great combination for drummers who want perfect drum sounds without compromising with the acoustic sound. The Ddrum4 sound module offers the fastest trig response time on the market, and together with Ddrum Red Shot Triggers you'll get a perfect combination of acoustic and digital drums. Solid little trigger. Works great with multiple drum brains/modules. Bought this for our drummer as a Christmas gift to use for live application (triggered kick drum off a Roland SPD-S) and so far it's been smooth as smooth can be. Wasn't sure about it at first due to a few friends' reviews but am really happy we went with the ddrum and will trust them for all our triggerin' needs.. I ABSOLUTELY LOVE THIS THING!!!!!!! Very well built and very acurrate response even when i use duall bass pedals! I love this trigger and highly recommend it. Thank You AMS! !